Exciting news! 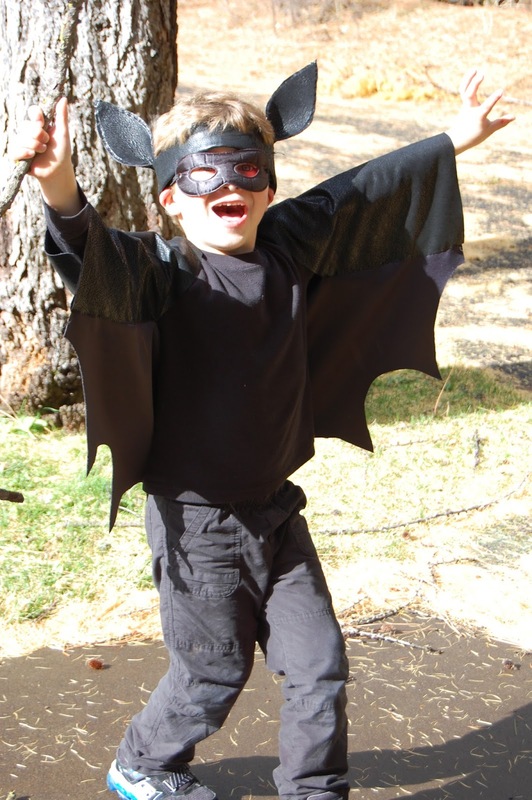 Black Butte School has an upcoming performance called Winter Magic. We invite you to join us to watch our performance on Thursday December 17th, at 6pm in the Community Hall of Camp Sherman. Following the performance we will have a dessert potluck with lots of yummy sweets. Winter Magic is a variety show, including group performances from the whole school, individual acts, and small group acts. We students will perform our own theatrical, musical, or dance performances. Also, Ms. Sharp our teacher has organized some whole school acts for you to enjoy. 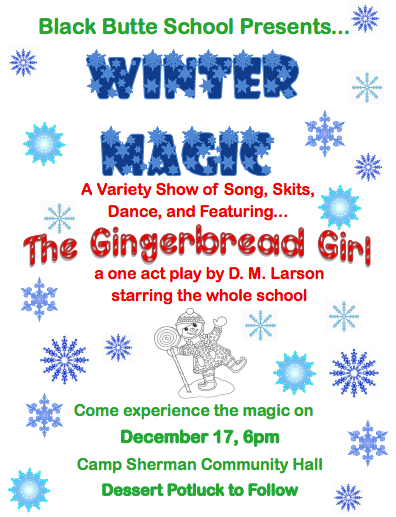 The show will feature a short play called the Gingerbread Girl, written by D.L. Lawrence, performed by all of us. We have been practicing for this show every Tuesday and Thursday during our performing arts class. During that time, we make plans, practice and learn about music, rhythm, beat, theater, and dance. Our teacher Ms. Sharp is organizing the performance. Holly Foster, Zion's (grade K)Grandma, is helping us to learn some songs and she plays the piano. We hope for the best and that you will come to enjoy our show! To be thankful means not to just say that you are thankful for something. It means to truly believe that the thing you are thankful for is something that other people might not have and is something you love. For example, Ilya (grade 6) said, “I am thankful for easy access to food.” All over the world kids Ilya’s age don’t have refrigerators and easy access to food and water. So to be thankful means to love that thing, be grateful for that thing, smile about that thing, and recognize that other people might not have it. On Thanksgiving it is tradition for most Americans to have a big feast. We do this because of a feast of abundance between colonists and Native Americans. I am thankful that I get to be with loved ones and get all that yummy food on Thanksgiving. Not everyone can do this, for multiple reasons: because of the lack of food and maybe even the lack of loved ones. We need to realize what being thankful is. As part of our Field Studies class we took a trip up to the top of Santiam Pass. The point of the trip was to learn about the B&B Complex Fire and how we can prevent large fires in the future. We went to an information kiosk that had information about the B&B Complex Fire with explanations of what happened and why. The students liked seeing a map with a timeline of the B&B Complex Fire and it’s growth. Next we went on a hike in one of the areas that was burnt to see how it how it has grown back, and how different the fire burnt in some of the areas. We saw lots of snow brush and manzanita. In some of the areas almost all the big trees survived and in other areas almost all the life was sucked out of it. This trip was on the day of the first snow of the year. So we hiked in about four inches of snow. 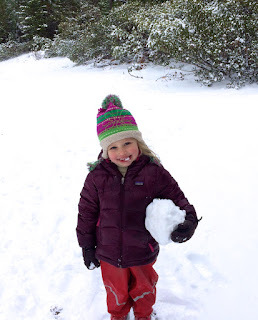 We had a bit of time to play in the snow too. Overall it was a fun day and we learned a lot about how fires have effected our community. Join Black Butte School and the Lake Creek Lodge for a buffet of pies this Thanksgiving, Thursday November 26 from 2-4 pm at the Lake Creek Lodge. 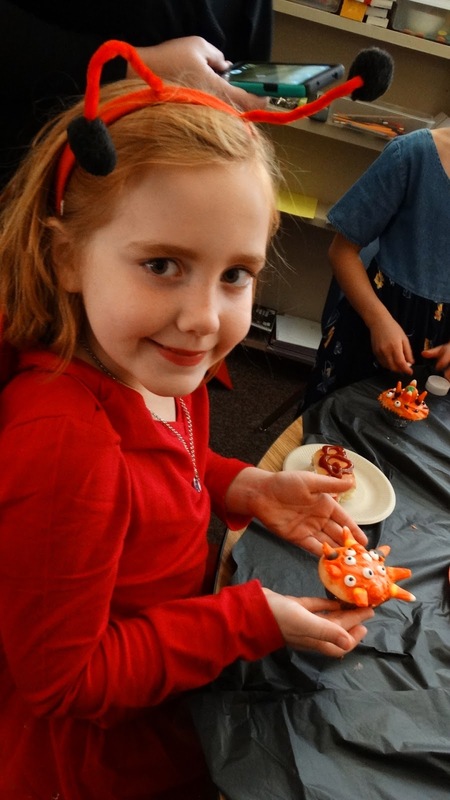 This is the first Thanksgiving Pie Extravaganza hosted by Lake Creek Lodge and the Black Butte School Parent Teacher Organization. There is no cost to attend, however donations will be accepted to benefit our school! We will be using the donations for supplies, field trips, activities, and more. 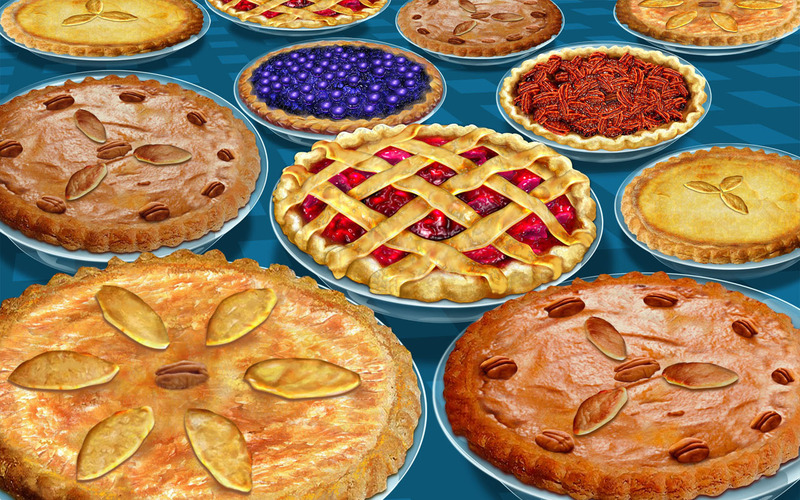 Please join us and help yourself to as much pie as you’d like. We will have every kind you can think of: blueberry, Cherry, Peach, Pumpkin, and more. Our very dedicated parents are making delicious pies of all flavors for the event. We at the Black Butte School are grateful that the Lake Creek Lodge is organizing this event...and thankful for our wonderful parents and grandparents for contributing pies! Wreaths bring holiday cheer! Black Butte School sells quality wreaths that are decorated with a bow, cones, holly, noble fir, juniper, pine, and incense cedar. The fresh evergreens smell great. Students sell these wreaths each year as a fundraiser for school field trips and other activities. 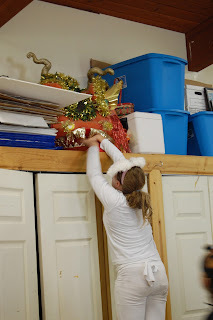 “The community generously supports the school every year through the wreaths. It’s wonderful to see so many decorating town. Each wreath is a reminder of the support shown to the students and school,” says Jane Petke, wreath fundraiser organizer and head of our Parent Teacher Organization. About $5000 is raised for the school each year through this fundraiser. However, last year the school raised over $7,000! 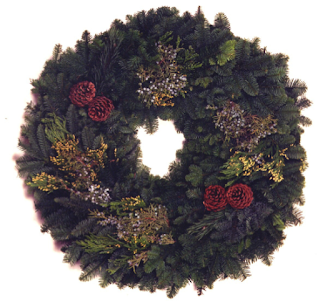 There are two sizes of wreaths available (27" and 32" diameter), plus options for Fed Ex delivery. Wreaths are available after Thanksgiving through early December, but don’t wait to order your wreath, contact a student or the school today. To download an order form click on this link. On October 30th Black Butte School had a Halloween Party. 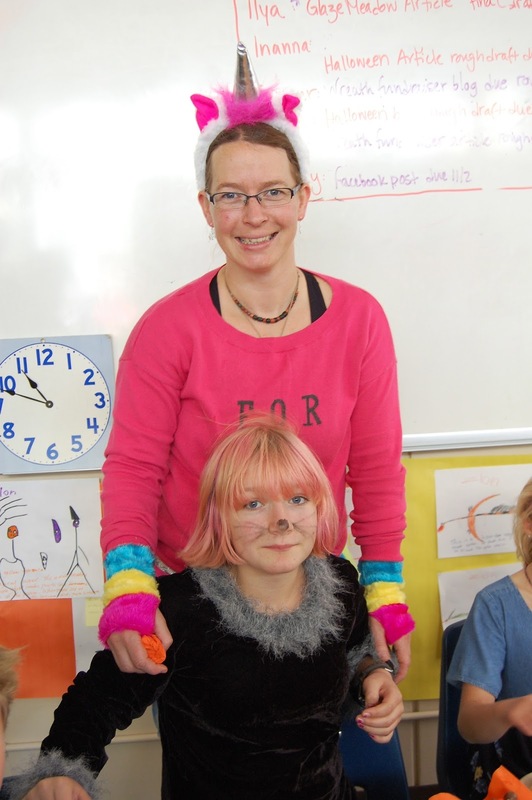 During the morning, students and teachers came to school dressed up as a plant or animal from the local environment, but during the afternoon, the party truly began. During the afternoon, parents started arriving. They brought treats!!!!!!!!!!!! While the adults set up the treats inside, the students went on a scavenger-hunt. During the scavenger hunt, I was the first one to find a clue that everyone else was stuck-on. At the end of the scavenger hunt there were M and M’s. Inside the treats looked great. Some of the treats included: finger hot-dogs, red Gatorade as blood, and make-your-own cupcakes. Lady bugs make the best cupcakes! P.E. 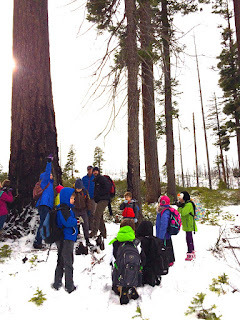 at the Black Butte School is pretty fun! We all almost always love or like the game we play. The first couple weeks of school we learned about and played soccer. All the kids are great at soccer. For the past few weeks we haven't really had a specific sports theme, but we always play really fun games. We only have P.E on Tuesdays and Thursdays, I kinda like that, because then no one feels like they are being pushed too hard. My favorite game that we have played, so far, is Hi-Li. Hi-Li is kind of like tennis, except instead of having to hit the ball, you catch it and throw it back to the person who threw it to you. We usually do that in pairs of two for about 15-20 minutes. Then we all get together and we have to try to throw the ball into the one of five different buckets. We have five balls each, the first bucket is worth one point, the second is two, the third is 3. The person with the most points at the end of the time period wins! All in all, P.E is really fun here at Black Butte School. I love almost all of the games that we play and I hope the other kids do too. I am looking forward to some of off-campus P.E. adventures we will have later in the school year like cross-country skiing, downhill skiing, swimming, and rock climbing!